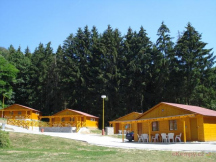 Camping Terasy - Pňovany, Plzeň-sever | Car camp Terasy is located on a field ner dam Hracholusky. For accommo.. Car camp Terasy is located on a field ner dam Hracholusky. For accommodation you can use tents, caravans (own or rented ones) and cabins. In the camp you can use services of a restaurant and store with various goods. Swimming possible in dam nearby. In the surrounding you will find several interesting sights. You can visit castle Pňovany, Luhov, Úlice, Rochlov, Trpísty, ruins of castle Buben, ZOO in Pilsen or Stříbro, which is about 10 km from the camp. Sehr gute Lage ,nette Besitzer,war sehr zufrieden .